at the east and west of Stokesley. This Enhancement Project, however, relates only to the sections that are within the town area and are readily accessible to the general public. 1. All the numbered items, with the exception of 3, 6, 12, 15 and 17 relate to issues mentioned in the RRC reports. 2. Items 6 and 12 are considered to be desirable in terms of current legislation on safety; however they do have historic context that may over-ride such factors. 3. Item 3 is an on-going maintenance factor. Discussions with the Highways Authority are needed. 4. Item 15 has been proved by a Group survey of opinion to be a very desirable feature. 5. Item 17 is a weir that was built by someone unknown; it is causing exceptional depth at this point and also causing silt to build. 6. 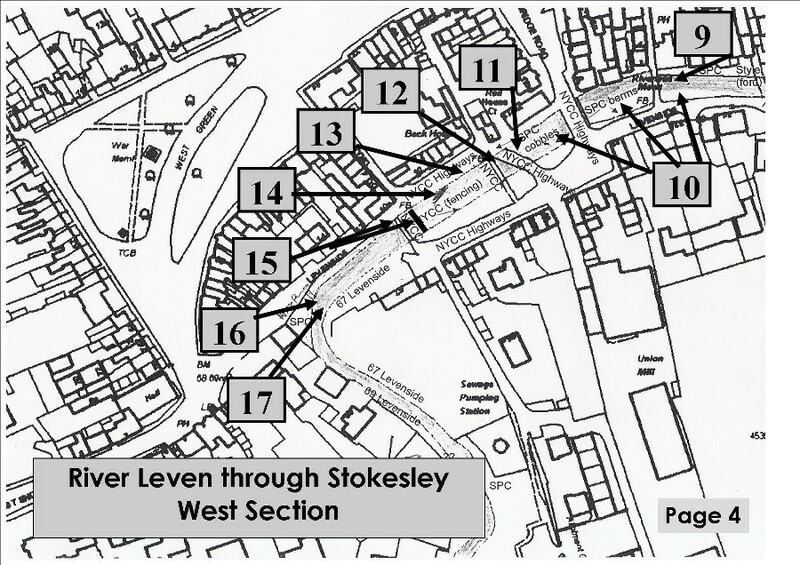 The major factor of concern is the low level of water running through Stokesley; its quality can be improved by the measures enumerated but the controlling factor is the size of sluice upstream. Any change to this would need Environment Agency collaboration and expenditure of quite a lot of money. 7. Lack of fish in the river is another concern although recent information suggests that the residents of the Leven Banks Estate have secured the co-operation of the Environment Agency in the provision of a fish ladder, or its equivalent, at the downstream sluice. 8. Maintenance of the stone work along the river is necessary; inspection and listing is needed. 1. Silted areas that have become overgrown with plants and weeds — could these be developed for play areas with some hard ground cover? The water channel is quite narrow. 2. In-river growth along this wall will protect the wall and will be allowed to develop. 3. Traffic Ford — suitable only for 4x4s and large vehicles. The wash from these is eroding the grass banks. Protection or vehicle speed control needed. New dry ford with water piped beneath??? 4. Brushwood fingers need to be installed to encourage plant growth along banks is needed. 5. Tree line of riparian landowners that should be kept from over-growing the river. 6. Plank footbridge — widen, give it handrails? It has historic context. 7. Private concrete ford — causes silt back-up. Rebuild with piped underpass for water? 8. Trees along the south bank should not be allowed to overgrow the river as the shade discourages river plant growth. Assessment needed for early action. Modify the berm beneath as in 10. Drain outfall that discharges oily waste water. Install pipe to control the outflow into midstream or downstream between the nearby sludge bed and river wall. 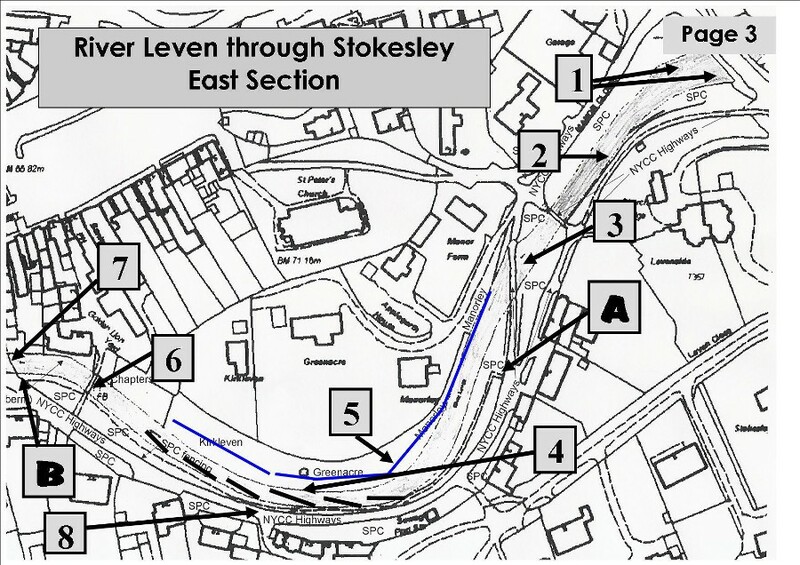 River Berms inserted by Parish Council. Modify the stonework and modify the earth fill for drainage; plant with suitable plants or pave and insert plants in pockets. Make accessible to the public? Sludge bed. This has become oily with the drain discharge (13). Re–make or remove in order to form a new bed using edge stone as the other berms. Paved ford, now unused. Remove, breach or reconstruct with water carried below in pipes. RRC consider that this ford causes silting up-stream. They would prefer to see a gravel bottom to encourage migrating fish. Concrete plank footbridge — widen, give it handrails? It has historic context. Consider provision of public access to a paved area below the existing access steps. A to B on East Section. Footpath along Levenside. 1. The footpath was installed by the Parish Council along the grass verge. It needs re-assessment as it is not really suitable for the wheeled vehicles used by movement impaired persons. It is too narrow for mobility vehicles or for two people to walk side-by-side. Along part of the length the path is very near to the river bank and there is a tendency for the paving slabs to slip towards the river. Along another section it is below grass level so that, in wet weather, water pools and prevents use; people have to climb over the railings beside the road in order to progress. Near point B the path is so steep that mobility vehicles cannot really use it. Near item 6, the footbridge, where there is a seat the earth is mostly bear of grass and is impassable in wet conditions. 2. It should be considered whether the path is really viable and abandoned or whether some riverbank structural measures ought to be taken to make path reconstruction viable. 3. Along the same stretch the river bank is patchy in terms of natural growth; ducks have many tracks in/out of the stream. Much of the problem is caused by the lack of sunlight due to the overgrowth of trees on this south side. Some thought is needed to improve this section’s ambience. 4. Along the grassed riverside of Manor Close the tubular metal railing mounted in concrete posts is in a deplorable condition through young people jumping on the tubing; most sections are bent and a number have to be replaced on a fairly regular basis. The whole railing should be replaced with the timber variety used with great success elsewhere along the river. Opposite here, on the south bank, there is similar railing with rusty tubes – all should be made in timber for uniformity. Children in wellies. The Ford at Location 3 on the East Map is a favourite place for children to paddle in wellies to seek fish of the tiddler variety. They also make ‘sand’ pies of the soil in this area. At one time they were also able to enjoy this pastime in the areas 1 and 2. The latter area would be far safer because of the heavy vehicles that travel through the ford. There could be other areas further westward if the berms were to be made more amenable to use. It is uncertain whether wellie activities are very popular in the weir area. Children Feeding Ducks A very popular pastime much frowned on by the RRC because of the attraction of rats to uneaten bread. RRC recommend warning signs with suggestions for the right kinds of food to provide. Children on Ponies Again, the ford at 3 is a favourite meeting and crossing place. At one time the crossing place was in locations 1 and 2 where cattle used to cross. MORAL The river should be a natural place for children to enjoy; considerable thought should be given to this aspect as part of the philosophy for the Enhancement Project.